Changi Airport Group (CAG) and JCDecaux have extended their exclusive partnership to the airport’s new Terminal 4. Following the move, JCDecaux has unveiled a range of advertising media assets at the new terminal. The offerings open with an exclusive takeover by healthcare solutions provider Mundipharma which showcases its BETADINE range of consumer healthcare products. The new terminal will contain more than 60 digital and static advertising sites at crucial touchpoints. 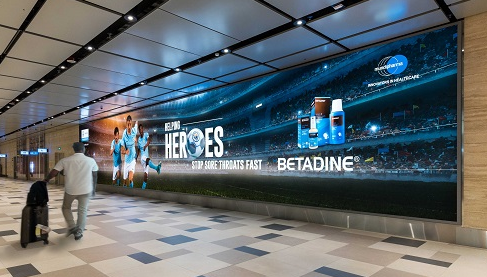 This includes hanging LED screens, lightboxes and digital screens enabled with JCDecaux’s Dynamic Solution. This is to offer advertisers the ability to communicate to their target audience in a personalised manner. “Both companies started collaborating on T4’s advertising media planning and design very early with the aim of placing them at visible locations while ensuring their seamless integration with the terminal environment,” Lim Peck Hoon, CAG’s executive vice president, commercial, said. “JCDecaux is thrilled to expand our advertising media footprint to Changi’s latest and most innovative Terminal 4, replicating our proven strategy of “Big, Bold and Impactful” in the 3 existing terminals,” Evlyn Yang, managing director of JCDecaux Singapore, said. Annuar has over 30 years of experience in the telecommunications industry. .. The orangutan wearing sunglasses will either be removed or touched up. ..